Baked Penne with Sausage & Mushroom Bolognese made with sweet Italian sausage, mushrooms, marinara sauce and dry red wine. 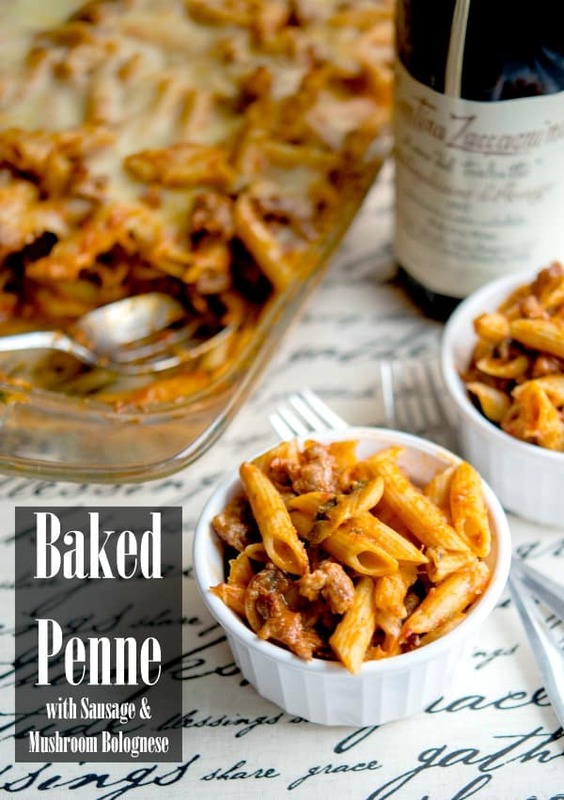 Sometimes you just need a classic baked pasta dish to warm the soul and this Baked Penne with Sausage & Mushroom Bolognese certainly did not disappoint! This dish is perfect for a busy weeknight as you can prepare most of it the night before; then bake for 30 minutes when you’re ready to eat. Heck, you can even prepare the whole thing; then just microwave or reheat individual portions the next night too. 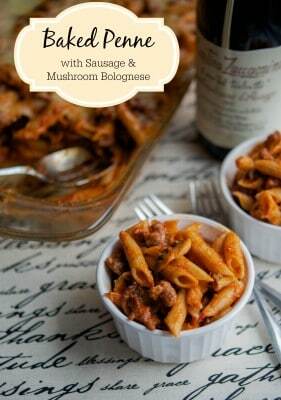 For this recipe you’ll need penne pasta (I used Barilla Plus), your favorite marinara sauce (I generally have homemade marinara sauce in the freezer so I used that, but you can use whichever brand you prefer), sweet Italian sausage, mushrooms, dry red wine and shredded mozzarella cheese. Start by cooking your pasta according to package directions. Next, remove the sausage casings (or use ground sausage) and cook on top of the stove until the sausage is crumbled and no longer pink. Add the mushrooms and cook until soft; then add the sauce and wine. 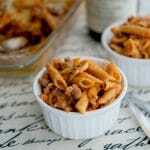 Drain the cooked pasta and add it back to the pot along with the sauce and some of the cheese; mix well. Place in an oven safe baking dish and cover with the remaining cheese. Bake in a 350 degree F oven for about 30 minutes until hot and the cheese is hot and bubbly. If you like your meals a little spicier, then use hot Italian sausage or even Spanish or Portuguese chorizo in place of the sweet Italian sausage. This recipe makes enough for 8 people, but trust me you’re going to want the leftovers. Keep out whatever you think you’ll eat and freeze the rest into individual portions for those last minute lunch or dinner plans. ~Enjoy! Heat the oil in a large, nonstick saute pan over medium heat. Remove the casings from the sausage and add to the pan. Crumble the meat and allow to brown for 5-7 minutes. Next, add the sliced mushrooms and saute for 4-5 minutes until softened; then add the marinara sauce and red wine. Prepare pasta according to package directions; however, reduce cooking time by 3-4 minutes so that the pasta is al dente and not too soft. Drain. Add the pasta back to the pot along with the sauce and 1 cup of the mozzarella cheese. Mix well. 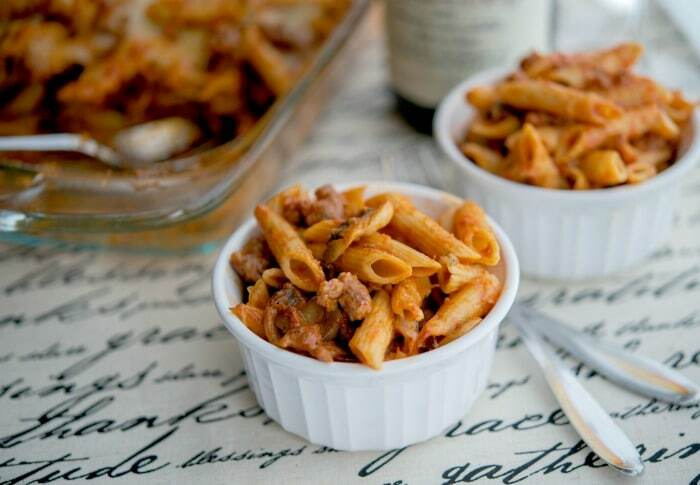 Place the penne in an oven safe, 13x9 (3 qt) casserole dish, top with remaining cheese and bake for 25-30 minutes or until cheese is melted and bubbly. I cannot begin to tell Carrie’s readers and blogger friends what a special person my daughter is. 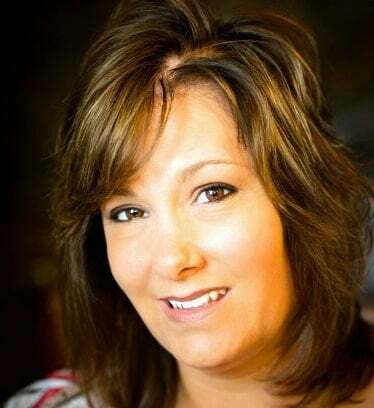 Not only is she a wonderful cook (always enjoy her meals), but she is always there as a wife, mother, daughter, granddaughter, aunt, niece, cousin, and friend. In one day, while I was traveling to New Jersey, she and her husband made all the arrangements for her grandmother’s final goodbye. My mother had the loving send off she would have loved. And I am eternally grateful to Carrie (and Don). Love you both, and your wonderful daughter’s. I am sorry to hear about the passing of your grandmother, and I am very excited to try this recipe. Thank you so much Chesney. I hope you enjoy the recipe as much as we did.